As is clear through-out The Knowledge, one of the fundamental drivers for a vibrant civilisation is its finesse in harnessing thermal energy. Fire is used for everything from cooking food to unlock nutrients and kill pathogens, to roasting lime for mortar and rebuilding, smelting metals and forging iron tools, and creating many of the fundamental substances that society replies upon. 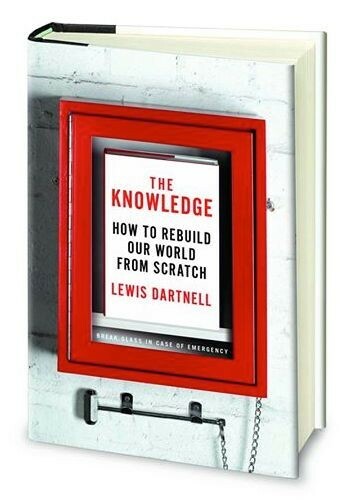 Whilst the book isn’t a survival manual with wilderness skills, starting a fire is an interesting problem and charcloth makes the ideal tinder. Charcloth is made by carbonising cloth using the heat of a fire; it’s analogous to charcoal produced from carbonised wood. And the beauty of this, from the point of view of pulling yourself by your own bootstraps, is that once you’ve started one fire you can create charcloth and use that to greatly simplify starting all other fires from then on. Charcloth is perfect for not just catching sparks from flint and steel, but its blackened surface is also ideally-suited for absorbing heat and igniting from sunlight focussed with a pair of glasses or other lens (or even a coke can or bottle of water as explained in my How-To video here). To make charcloth for yourself all you need is a few scraps of cotton or linen and an old tin with a tight-fitting lid. The pictures of the process here are kindly provided by David Cotton (no jokes about nominative determinism for this article please…) Stuff the cloth into the tin and leave atop the hot embers of a fire – the heat will drive out all the moisture and other volatiles and transform the material into a black, carbonised substance primed for combustion. 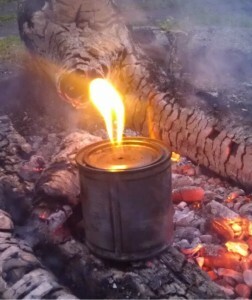 If you fit the lid tightly onto the tin the expansion of air inside will soon push it off with a pop and you’ll find that your cloth inside will burst aflame (a lesson I learned the hard way first time I tried this…). So simply punch a small hole in the tin lid to allow the pressure to escape, but still restrict the access of oxygen in to the hot cloth. You may find a little jet of flame ignites from the escaping vapours. 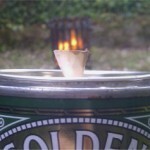 After a few minutes, carefully remove the hot tin from the embers and shove a small wooden plug into the hole while everything cools. Once the tin is cool to the touch, pry off the lid and retrieve your charcloth. There are plenty of videos online showing how to easily use this for catching your next fire.